An explosion of research over the last 20 years has enhanced scientific understanding of the brain’s function and development. Here’s what funders need to know about the new research to identify opportunities for impact. For more on this new brain research from a scientist in the field, see What Neuroscience Tells Us About A Child’s First Years: Q&A with Dr. Martha J. Farah. Implications for funders: Funders who invest in early childhood help kids’ brains make the critical connection necessary for success throughout children’s lives. Implications for funders: Preventing and addressing sources of toxic stress in early childhood help improve long-term outcomes for children. 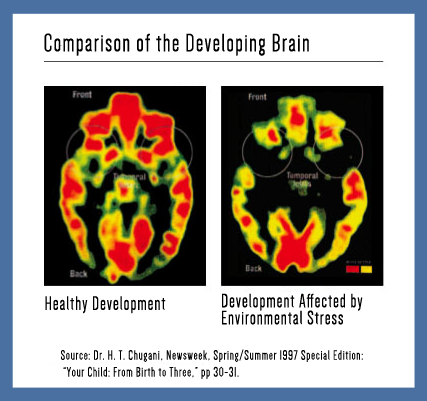 Harmful exposures can also change the brain. 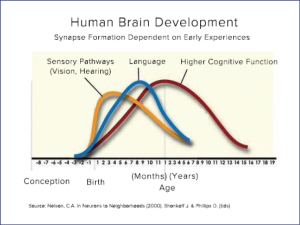 As mentioned above, normal prenatal and early childhood brain development depends upon a complex series of critical, sequential, and highly orchestrated processes. Exposure to toxic chemicals such as lead, methylmercury, and polychlorinated biphenyls (PCBs), disrupts these processes, and has been linked to adverse childhood neurological and behavioral outcomes including ADHD and loss of IQ. While the effects of these three toxins are well studied, research on a host of other chemicals suspected of causing adverse health effects is still ongoing. Implications for funders: Funders can help prevent and reduce childhood exposure to harmful chemicals by eliminating these exposures in built, consumer, and natural environments, by advocating for improved policies and regulations, and by supporting research and innovation to further assess chemicals whose effects have not yet been fully tested. Positive relationships are protective. Research has shown that having at least one caring and consistent relationship with an adult can help protect children against the effects of stress in other aspects of their environment.3 This important role of parents and caregivers in the early years is prompting renewed interest in helping families to help children – for instance, working to ensure that caregivers have the information and the means to provide a stable and loving environment. Implications for funders: Funders can help prevent and treat the effects of toxic stress by ensuring positive relationships between children and caregivers, both at home and at school. For additional information on fostering positive relationships and addressing stress, see Two Generation Lens: Helping Children by Helping Families. For additional information on opportunities to further research in this area, see Investing in Early Childhood Innovation: Q&A with Dr. Jack P. Shonkoff. Timing is important. There are “windows of opportunity” that appear optimal for developing certain abilities and skills. To date, this concept has been most explored in the context of language acquisition. Six-month-olds, for example, can distinguish sounds across a wide range of languages, but this ability will mostly disappear by the time a child reaches her first birthday.4 Another “window” may occur later in life; research has shown a burst of brain development in adolescence to early adulthood that appears to be related to impulse control and decision-making.5 There remains much more to be learned, however, about the most effective timing for particular interventions. Implications for funders: Research suggests investing early for maximum effects on brain development. Working with young parents may also be particularly beneficial since it may be possible to “catch” two critical periods (for both parent and child). Developing science also provides opportunities for funders to fund research and evaluation of what kinds of programs and timing may work best to promote healthy development and counter stress. Center on the Developing Child at Harvard University: Dr. Jack Shonkoff and his colleagues are at the forefront of efforts to connect brain research and other relevant science to effective programs and public policy in support of child development. The Center on the Developing Child hosts the Frontiers of Innovation Network, a group of researchers and practitioners working on aspects of this challenge. The Center is also a good source of videos, interactive features and reports and working papers associated with new brain research. Better Brains for Babies (Georgia): A state-wide public-private collaboration that has excellent educational resources for both parents and policy makers around early childhood development. Dana Foundation: The Dana Foundation is a New York-based private foundation dedicated to advancing research and disseminating knowledge about the brain. Zero to Three: This national non-profit provides information on early childhood development to parents, policy makers, and early childhood educators. Short article by Nicholas Kristof of The New York Times on toxic stress in childhood and the release of a 2012 American Academy of Pediatrics policy paper on the relationship of poverty and stress to health and educational outcomes. The Executive Summary of From Neurons to Neighborhoods by Shonkoff, J. and Phillips, D. eds. National Academy of Sciences, 2000. Institute for Learning and Brain Sciences at the University of Washington: Headed by Dr. Patricia Kuhl, I-Labs has a dual mission of both conducting cutting edge brain science and translating findings for use in program design and public policy. In early childhood, I-Labs partners with the non-profit Thrive by Five Washington to help “translate” findings to policy makers, childcare providers, and parents. Child Study Center at New York University: Like I-Labs, this university center conducts ongoing research, but with a focus on mental health. Director Dr. Laurie Brotman was instrumental in developing the Parent Corps program, a school-based preventive program working with low income parents. The LENA Foundation: LENA is a relatively new technological device that allows for the automated collection and analysis of information related to the linguistic interactions between children and caregivers. Whether use of the device can help improve children’s linguistic abilities is currently being tested in several small trials, including one at the University of Chicago and another in rural Colorado by Save the Children. The city of Providence, RI is also piloting a LENA program with Bloomberg Mayor’s Challenge funds. Norlien Foundation and Alberta Family Wellness Initiative (Canada): The focus of the Norlien Foundation is on brain development’s connection to later mental health issues and specifically addiction. They fund research, information sharing, and demonstration programs related to early childhood and family support. Many early childhood research and advocacy organizations, including: Better Brains for Babies, Zero to Three, Thrive by Five Washington, Ready Nation, Ounce of Prevention, and Too Small to Fail. 2 See, for example: Dr. H. T. Chugani, Newsweek, Spring/Summer 1997 Special Edition: “Your Child: From Birth to Three”, pp 30-31; Ratcliffe, C. and McKernan, S.
3 See, for example: Shultz et. al: The relationship between protective factors and outcomes for children exposed to violence. RAND. Violence and Victims vol. 28, no. 4, August 2013.